Zoomtopia is coming up quickly, and we’d like to invite you to this outstanding annual user conference. Even though we’re hosting Zoomtopia in the heart of the Silicon Valley, it’s not just for high tech companies. We’ll be celebrating our customers from various fields, such as healthcare, education, financial services, business, government, and more. 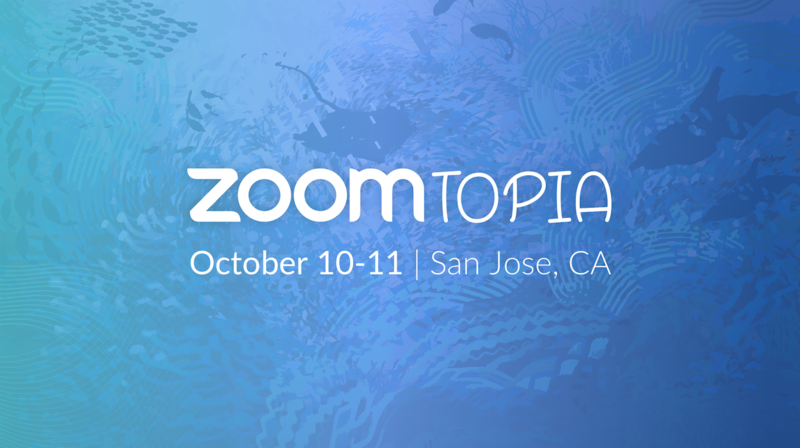 Zoomtopia is your chance to build connections in your field, succeed in your work, hear from industry leaders, and maximize your Zoom investment. If you’re in the education sector, Bringing Video into the Classroom breakout session is tailored to you. Learn how to enable virtual classrooms and online learning environments with Zoom that your students and teachers will love. In this session, you’ll hear from Tain Barzo, Manager, Classroom & Audiovisual Technologies at Stanford University School of Medicine and Shelley Griffin, IT/Video Conferencing Coordinator at Kansas State University. The highly interactive Expanding the Traditional K-12 Classroom with Zoom session will also be valuable for those who work in the education field. In this session, California park rangers will show how to expand your students’ horizons with virtual field trips. Healthcare professionals will explore best practices for developing a successful Zoom healthcare/telehealth program at our Zoom for Healthcare session. Panel speakers include Linda Branagan, Director of Telehealth Programs at University of California San Francisco Medical Center), Joshua Scales, HIT Manager at Tennessee Primary Care Association, and Bill Szaroletta, Technology & Innovation Officer at the University of New Mexico, Project ECHO. Are you an AV designer or consultant? Then AV Integrator Bootcamp breakout session will be extremely helpful to you. Zoom’s Professional Services Team will discuss Zoom Rooms design and setup based on our standards for huddle, conference, boardroom, and training rooms. Register ASAP to reserve your spot before early bird pricing ends Wednesday, August 15!